The art of misdirection is at the root of all stage and street magic. Some say that magicians and conjurers practice one of the world’s three oldest professions, and you can probably guess the other two. Performance magic can be done on stage or one-on-one, and the key to it is almost always misdirection. You have a limited amount of attention and you will be shocked at how easy it is for an expert to manipulate. Apollo Robbins, the famous performing pickpocket, even did a Ted Talk on it. Here’s an example of how misdirection works: the very, very old Shell Game. This is a trick that’s been on the go for thousands of years, and that is no exaggeration. The ancient Egyptians left the oldest known record of it. We’re going to give away the secret to this old trick. The amazing thing is, even if you know what to expect, it will still work if it’s done by a skilled magician like Glen – or by a skilled con artist. 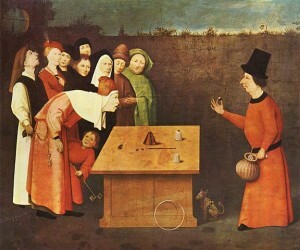 The shell game goes like this: there are three walnut shell halves, three bottle caps or three upside-down cups, and there’s a small ball or a ‘pea’. The operator places the pea under one of the shells and then takes bets – will the onlookers be able to guess which shell it’s under after the shells have been quickly hand-shuffled? The operator shuffles the shells, but if you have placed a bet, you will never be right about which shell the pea is under no matter how closely you watch. You always lose your money. Why? The fact is, by the time the shells are lifted, the pea isn’t underneath any of them and if it’s revealed, it’s because it has been slipped back in. You are distracted by the operator’s banter, by his movements and by other onlookers who are actually shills – friends of the operator who are part of the con. While your attention is directed away from the shells, the pea is slipped under a loose part of the table covering, slipped out from under a shell and palmed, or slipped off the edge of the table. The pea can be placed under a different shell just as easily; it’s often soft and compressible, not hard, as it appears to be. It is always exactly where the operator wants it to be, and you can never be sure that the other people watching and betting aren’t shills who are trying to draw you in. It’s a fun game at parties. On the street, it’s a classic con. If you look at the painting – a painting that is almost 600 years old, by Hieronymus Bosch – you’ll see another example of misdirection in a shell game. While the mark is paying attention to the game, his pocket is being picked. Don’t worry – Glen will never pick anyone’s pocket unless it’s requested! 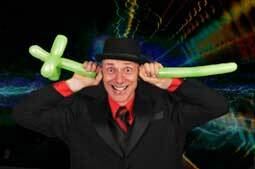 He’s a highly skilled Brisbane magician and Master of Ceremonies, and he will astonish you. This entry was posted in Posts and tagged brisbane, magician, misdirection. Bookmark the permalink.